By Dan Eden for viewzone.They have always been there. People noticed them before. But no one could remember who made them — or why? Until just recently, no one even knew how many there were. Now they are everywhere — thousands — no, hundreds of thousands of them! And the story they tell is the most important story of humanity. 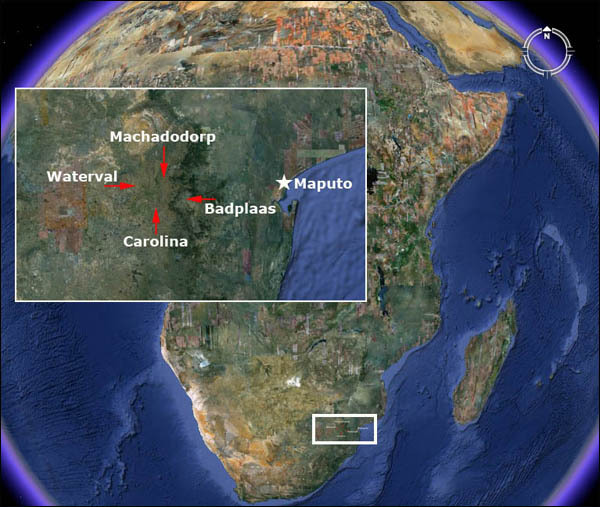 But it’s one we might not be prepared to hear.Something amazing has been discovered in an area of South Africa, about 150 miles inland, west of the port of Maputo. It is the remains of a huge metropolis that measures, in conservative estimates, about 1500 square miles. It’s part of an even larger community that is about 10,000 square miles and appears to have been constructed — are you ready — from 160,000 to 200,000 BCE! The image [top of page] is a close-up view of just a few hundred meters of the landscape taken from google-earth. 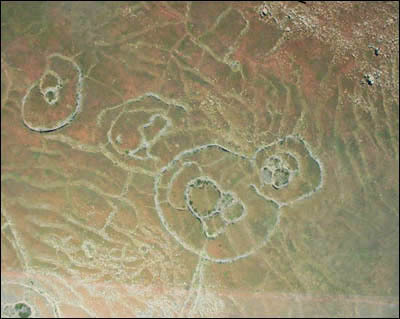 The region is somewhat remote and the “circles” have often been encountered by local farmers who assumed they were made by some indigenous people in the past. But, oddly, no one ever bothered to inquire about who could have made them or how old they were. A Rich and Diverse History When explorers first encountered these ruins, they assumed that they were cattle corals made by nomadic tribes, like the Bantu people, as they moved south and settled the land from around the 13th century. There was no previous historical record of any older civilization capable of building such a densly populated community. Little effort was made to investigate the site because the scope of the ruins was not fully known. 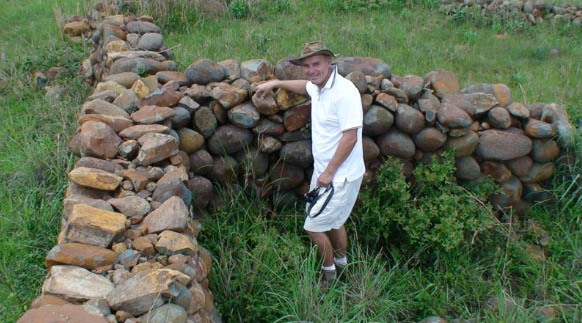 Over the past 20 years, people like Cyril Hromnik, Richard Wade, Johan Heine and a handful of others have discovered that thesestone structures are not what the seem to be. 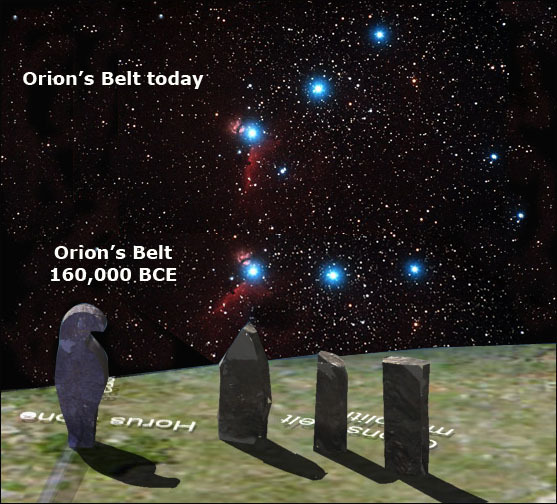 In fact these are now believed to be the remains of ancient temples and astronomical observatories of lost ancient civilizations that stretch back for many thousands of years. These circular ruins are spread over a huge area. They can only truly be appreciated from the air or through modern sattelite images. 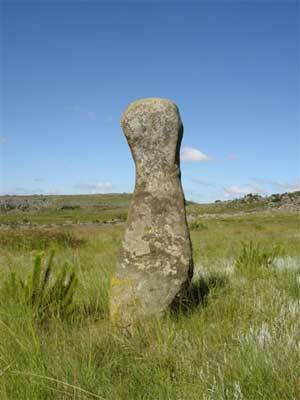 Many of them have almost completely eroded or have been covered by the movement of soil from farming and the weather. Some have survived well enough to reveal their great size [see above] with some originalwalls standing almost 5 feet high and over a meter wide in places. Looking at the entire metropolis, it becomes obvious that this was a well planned community, developed by a highly evolved civilization. The number of ancient gold mines suggests the reason for the community being in this location. We find roads — some extending a hundred miles — that connected the community and terraced agriculture, closely resembling those found in the Inca settlements in Peru. But one question begs for an answer — how could this be achieved by humans 200,000 years ago? This is what you will see on google-earth at 25 37’40.90″S / 30 17’57.41E [A]. We are viewing the scene from an altitude of 357 meters. This is not a “special” location — just one we picked at random, within the previously described area. 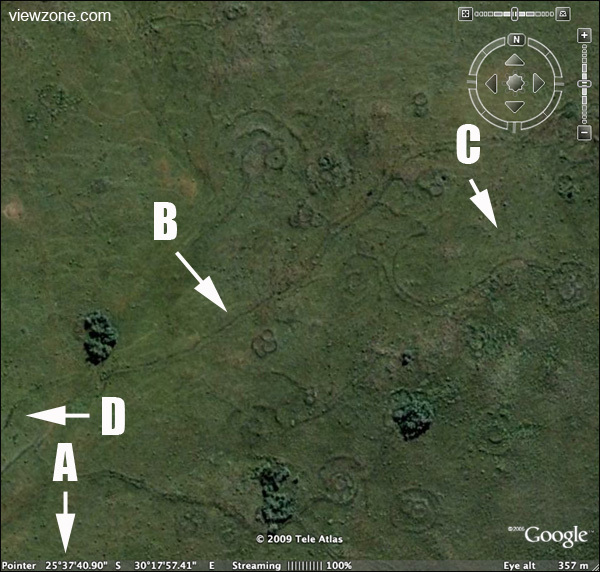 It shows artifacts that are everywhere and we encourage you to search the area with this great internet technology. 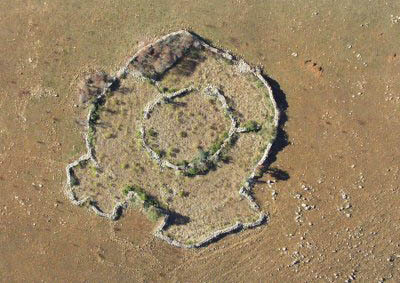 The circular stone structures are obvious from this view, even though they may not be visible from ground level. Notice that there are many very long roads [B] that connect groups of the circular structures. If you zoom out and follow these “roads” they travel for many miles. It would seem that humans have always valued gold. It is even mentioned in the Bible, describing the Garden of Eden’s rivers:Genesis 2:11 — The name of the first [river] is Pishon; it flows around the whole land of Havilah, where there is gold.South Africa is known as the largest gold producing country of the world. 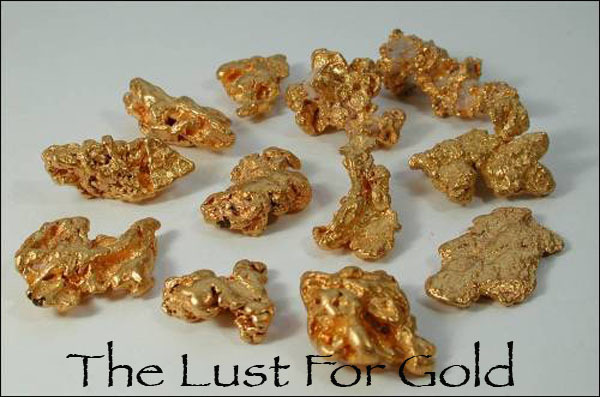 The largest gold producing area of the world is Witwatersrand, the same region where the ancient metropolis is found. In fact nearby Johannesburg, one of the best known cities of South Africa, is also named “Egoli” which means the city of gold. In September 1988, a team of international physicists came to South Africa to verify the age of human habitats in Swaziland and Zululand. The most modern techniques indicated an age of 80,000 to 115,000 years. What were humans like 160,000 years ago?Modern humans, homo sapiens, can trace our ancestry back through time to a point where our species evolved from other, more primitive, hominids. Scientists do not understand why this new type of human suddenlyappeared, or how the change happened, but we can trace our genes back to a single female that is known as “Mitochondrial Eve”.Mitochondrial Eve (mt-mrca) [Right: An artist’s rendition] is the name given by researchers to the woman who is defined as the matrilineal most recent common ancestor (MRCA) for all currently living humans. Passed down from mother to offspring, all mitochondrial DNA (mtDNA) in every living person is derived from this one female individual. Mitochondrial Eve is the female counterpart of Y-chromosomal Adam, the patrilineal most recent common ancestor, although they lived at different times. Mitochondrial Eve is believed to have lived between 150,000 to 250,000 years BP, probably in East Africa, in the region of Tanzania and areas to the immediate south and west. Scientists speculate that she lived in a population of between perhaps 4000 to 5000 females capable of producing offspring at any given time. If other females had offspring with the evolutionary changes to their DNA we have no record of their survival. 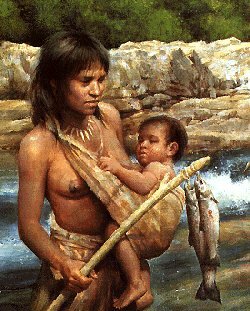 It appears that we are all descendants of this one human female. Mitochondrial Eve would have been roughly contemporary with humans whose fossils have been found in Ethiopia near the Omo River and at Hertho. Mitochondrial Eve lived significantly earlier than the out of Africa migration which might have occurred some 60,000 to 95,000 years ago. 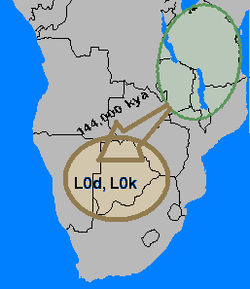 [right] The region in Africa where one can find the greatest level of mitochondrial diversity (green) and the region anthropologists postulated the most ancient division in the human population began to occur (light brown). The ancient metropolis in located in this latter (brown) region which also corresponds to the estimated age when the genetic changes suddenly happened. Ancient Sumerian history describes the ancient metropolis and its inhabitants!I’ll be honest with you. This next part of the story is difficult to write. It’s so shocking that the average person will not want to believe it. If you are like me, you’ll want to do the research yourself, then allow some time for the facts to settle in your mind.We are often made to believe that the Egyptians — the Pharoahs and pyramids — are where our known history begins. The oldest dynasties go back some 3200 years BP. That’s a long time ago. But the Sumerian civilization, in what is now Iraq, is much older. What’s more, we have translated many of their history tablets, written in cuneiform and earlier scripts so we know a lot about their history and legends. After 3,600 years of this work, the gods finally begin to complain. 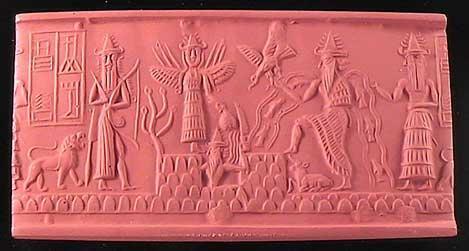 They decide to go on strike, burning their tools and surrounding the chief god Enlil’s “dwelling” (his temple). Enlil’s vizier, Nusku, gets Enlil out of bed and alerts him to the angry mob outside. Enlil is scared. (His face is described as being “sallow as a tamarisk.”) The vizier Nusku advises Enlil to summon the other great gods, especially Anu (sky-god) and Enki (the clever god of the fresh waters). Anu advises Enlil to ascertain who is the ringleader of the rebellion. They send Nusku out to ask the mob of gods who is their leader. The mob answers, “Every single one of us gods has declared war!” (Dalley 12, Atrahasis). This entry was posted on September 30, 2011 at 6:20 PM	and is filed under Annunaki Overlords. 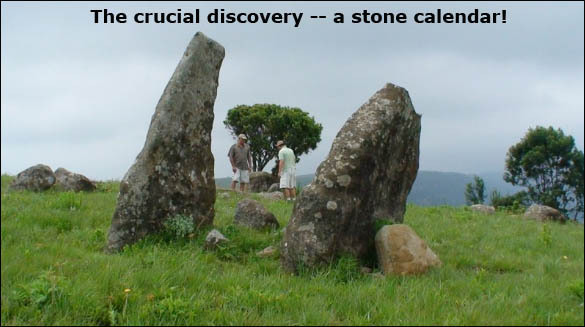 Tagged: Africa, archaeology, asia, Bantu, Bushmen, Civilization, Maputo, Michael Tellinger, Social Sciences, South Africa. You can follow any responses to this entry through the RSS 2.0 feed. Responses are currently closed, but you can trackback from your own site.